What’s this?!?! A blog post….it can’t be! Let’s just say that it has been quite awhile since I’ve posted over here but it’s time to bring that blog back! Things around here have been a whirlwind but in such a good way! We just returned from an amazing scrapbooking retreat in Oak Harbor, Ohio with our amazing kit club friends and already can’t wait to plan the next getaway together. Baseball season is in high gear with two tournaments the past two weekends and Tai just living it up in his happy place on the pitcher’s mound. Parker is getting ready for his huge once in a lifetime trip to Cooperstown in June and Nadi just finished up playing soccer for the first time. But….now…the part you are really here for….the scrapbooking! This week, I was invited to participate in an Instagram inspiration hop featuring the scrapbook.com affiliates. I created a super fun Disney layout for the event and I wanted to include some of the details here since I didn’t create a process video for this layout. For this layout, I started with the My Minds Eye Blast Off collection which works just perfectly with my Disney photos. 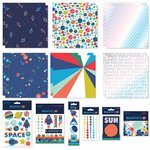 Right now, Scrapbook.com has a HUGE deal on this collection going on and I highly recommend picking it up with this bundle. Click here to check it out. I decided to fill in a few areas of the background paper with patterned papers from the collection in order to create more interest and variety. Then, i used chain stitching to stitch along the dividing lines of each section. This creates more continuity and gives the appearance of a patchwork, hand-created background design. In the planets section on the right side, I also fussy cut a few planets from my scraps and put them on dimensional adhesive to create even more depth and interest. Finally, it was time for my title, journaling, and embellishments. I used the embellishments from the My Minds Eye Blast Off ephemera pack that came with the bundle deal (you can also buy just the ephemera by clicking here.) I combined two different mini alphabets to create my title for this layout. One of them was the navy blue foam thickers called Happy Life from Paige Evans and the other was the puffy sticker multi-colored alphabet from Pink Fresh Studio. You can find both of those in the supply list below. I hope you enjoyed reading a little more about this layout as well as my return to blogging! I will see you again soon with more….